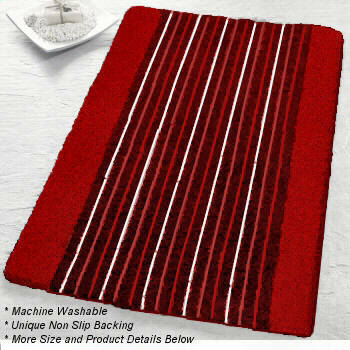 High quality, very soft low pile bath rug 15mm / .60in. Doors will easily open over this design. Ruby Red: Classic striped design with ruby red accents on the side and dark wine red in center with stripes of white, ruby red and light red. Taupe:This high quality low pile bath rug in taupe is just the right amount of color. Light taupe on the sides and dark taupe in the center with stripes of light beige, light taupe and medium taupe. Blue: Blue is the perfect color for your bathroom. Bright blue sides with dark blue in the center with stripes of white, bright blue and light blue. Elongated lid cover for the Highway design is a solid color and is coordinated with the side borders in the design.